Spring is here! Everyone knows that Spring = tons of NEW releases from all of the top design houses... and this year we are off to our best start EVER. Our first quarter set sales records but rather than take that money and save it like most rational adults, I've just decided to buy even MORE frames than usual... I'm sure there's some mental illness that can be assigned to this behavior... but who cares if I'm nuts? It means even MORE great selections for you guys. (just ignore me if I'm sitting in the corner talking to myself when you visit...one of our wonderful and sane staff will be happy to assist you). But enough of my problems lets get to the good stuff... 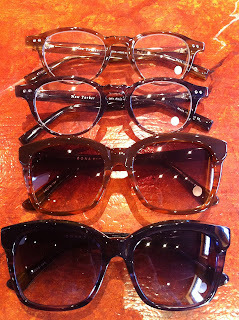 Above we have new DITA... both opthalmic and sun.